I love planting ornamental grass in containers. 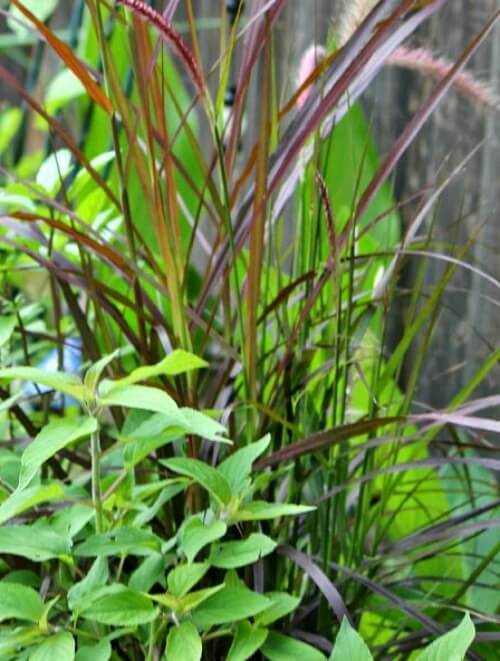 Ornamental grass is beautiful in a small space garden. In the photo above, I planted pineapple sage with ornamental grass in a contrasting color behind it for vertical interest. Most grasses are pretty much self-sufficient. 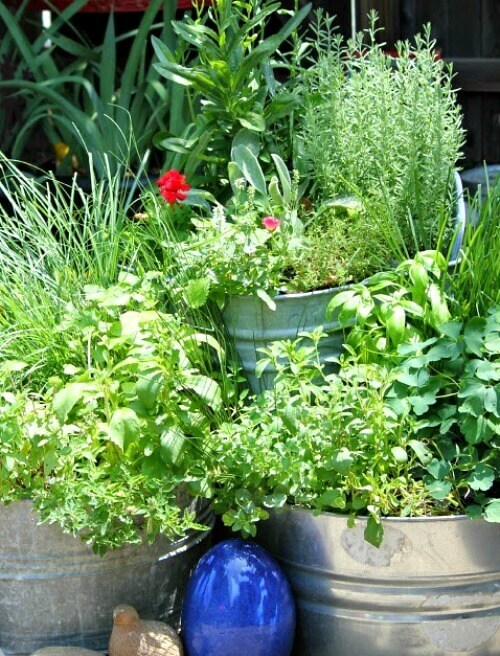 Potted plants need to be watered deeply and less frequently. 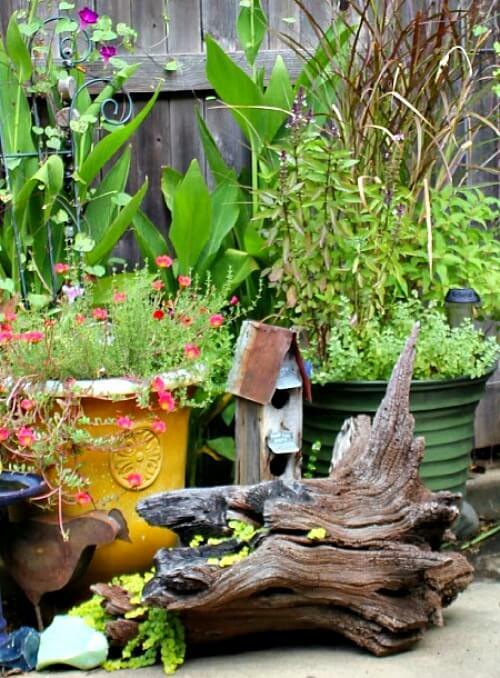 Allow the pot to dry out between watering unless you are growing a water loving species or marginal grass. Every two years remove the plant from the pot, replace the soil mix and divide the grass. Cut the plant into two pieces. Then replant each piece separately. Ornamental grass care for containers includes pulling out the dead blades. Some grasses will die back in winter and the blades will turn brown. You can leave them until early spring and then cut them back to a couple of inches from the crown. Brand new blades should grow and fill in the plant as spring progresses. Ornamental grass thrives in an area that gets at least 5-6 hours of sunlight daily. You need a container that is deep enough for the plant to have room to spread and to support the root system. Make sure the bottom of the container has adequate drainage. An excellent medium for ornamental grass is one part compost, one part top soil and one part perlite. Different types of grass have different needs. 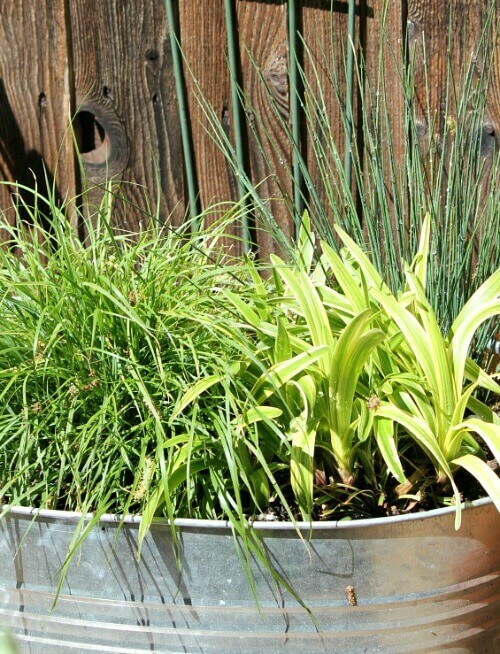 But as a general rule water your ornamental grass container when the top two inches of soil is dry. Fertilize annually in spring with sow release fertilizer. I think you will enjoy the texture and beauty ornamental grass will bring to your container gardens. That fountain grass is so pretty. You do a great job on photography. What a timely post. I was walking this morning and admiring the purple fountain grass in a neighboring yard. I have some empty whisky barrels that need plants and was wondering if I could plant ornamental grass in these containers. Looks like the garden center will be on my trip list either today or tomorrow to inquire about the best ornamental grass to plant in containers for this area. Your photos are so pretty. While we still have snow here in eastern Massachusetts, I have been planning to make more pot plantings in our small condo garden and porch…grasses will now be in our plans. Thanks for including your instructions and hints for growing. 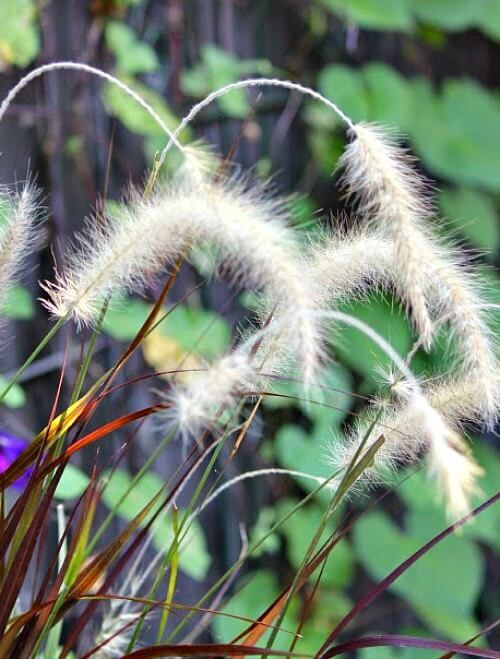 Your ornamental grass plantings were so pretty last year and the photos are gorgeous! We have some of different types of ornamental grasses planted in the yard and in one pot. Do you ever cut your hands on the sharp edges of the grass blades? Our grasses are DANGEROUS! And, when you get cut, it stings like crazy!! But we still LOVE THEM. No, I’ve never been cut. But when I trim them my arms itch till I soap it off. Good information, Brenda. I’ve been thinking I’d like to get some pink muhly grass to try. I like that it’s not so tall and the rosey color. I could add some smaller plants in front of it like you did in yours. It’s still so cold here, though, it’s gonna be a while. We have had sun and blue skies all week so that’s a good sign. It lifts my spirits for sure. 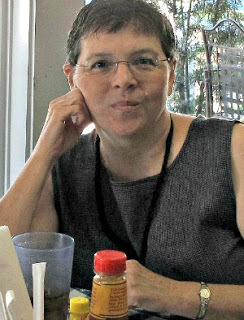 Brenda, you could have been a landscaper, you have a very good eye, and a real care for the plants.